A batch of these would make a most delicious Valentine’s treat. This year, for the first time in 33 years, Clyde and I have decided not to bother buying Valentine’s cards. We have never gone down the flowers or dinner out path, but we have always exchanged cards. But this year, we have finally come to the conclusion that Valentine’s is just not worth the £3 card each and that we’ll continue to love each other as much *or as little* as we do every other day. This year, I am embracing Valentine’s as a time to show your loved ones love, without unnecessary frou frou. What better way to do this than with a great big plate of Tiny Eclairs. Ok, so I couldn’t quite leave the whole Valentine’s thing alone completely. 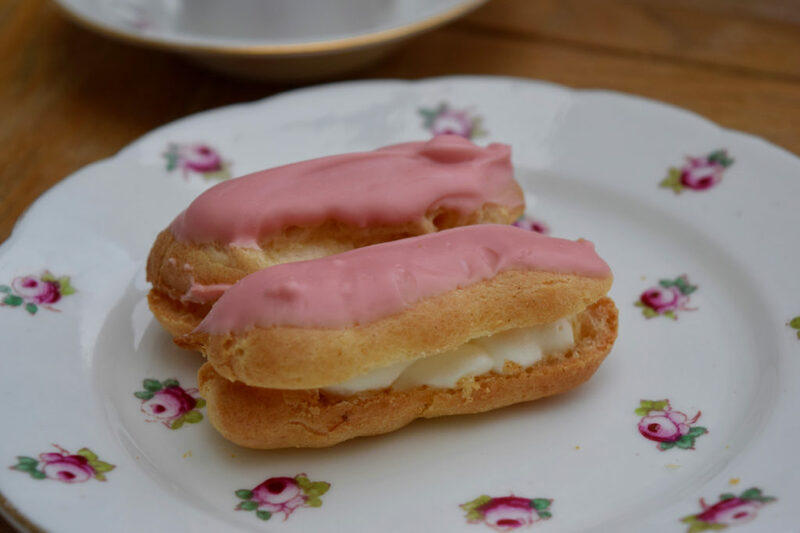 My Tiny Eclairs are pink, but that’s more for me than anyone else, because nothing is pink in my house. I have been wanting to make eclairs for ages, but time has not been a good friend recently. But, now, I have had plenty of practice and am happy to announce these Tiny Eclairs are almost perfect. A simple batch of choux pastry, and it is simple, just melting then beating; then some piping which is also simple, and quite therapeutic. 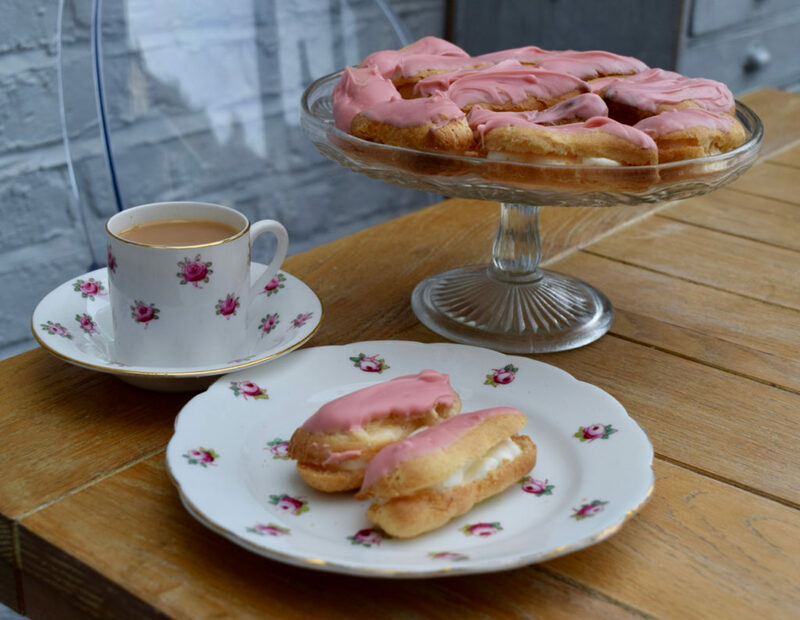 And if you really can’t face getting a piping bag out, then these eclairs could oh so easily be choux buns by just spooning the pastry instead of piping. You can then choose how to decorate your eclairs and if you don’t have pink chocolate to hand, go milk, dark or white. Or if you prefer a simple glaze, then ice them with some glace icing. Eclairs are the one treat I buy from a shop. But no more, now I’ve nailed homemade Eclairs I can make/eat them whenever I want. And gift them whenever I want, which, I’ll be honest will be less often then when I want to eat them. A big thank you for the recipe goes to the Belfast Telegraph. I made a lot of Tiny Eclairs today and gifted quite a few of them. Our house was busy, so at least 8 people ate these baked tokens of my love. They got great reviews from all, which has filled my heart with love, so much more than a tacky card would have done. Pre heat your oven to 180 degrees fan assisted and line two large baking sheets. 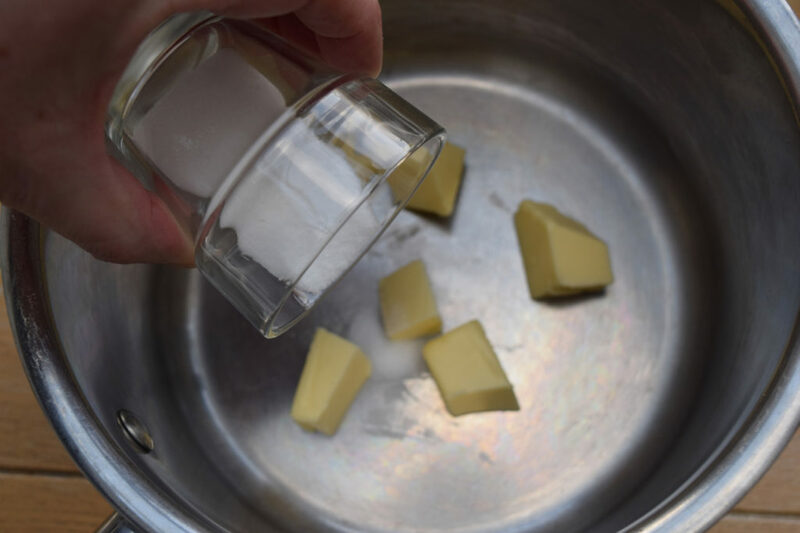 Take a good sized saucepan and measure in the butter, sugar and fizzy water. Put on the hob over a low heat and bring up to the boil. 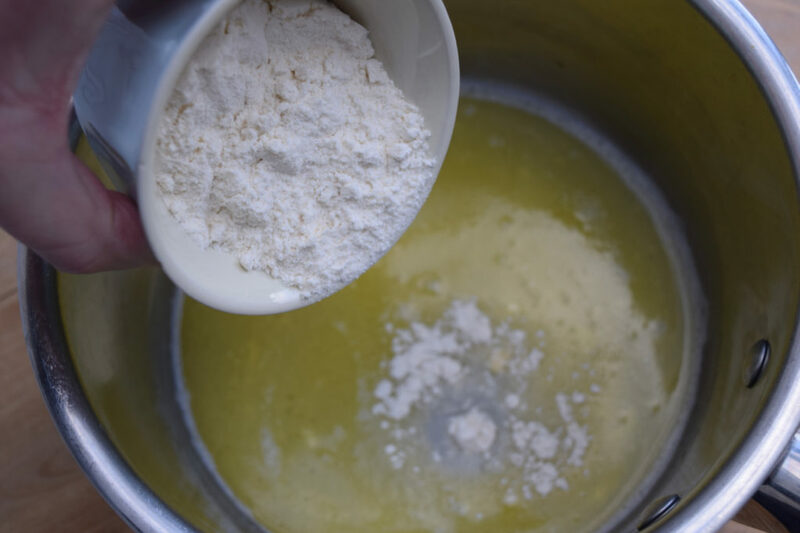 Take off the heat then beat in the flour with a wooden spoon, until smooth. Leave to cool for 15 minutes. Whisk the eggs then pour into the cooled mixture, a little at a time, beating as you add. You may not need all the egg, so add cautiously. Your finished dough will be a firm dropping consistency, and glossy. I used all but a tablespoon of my egg. 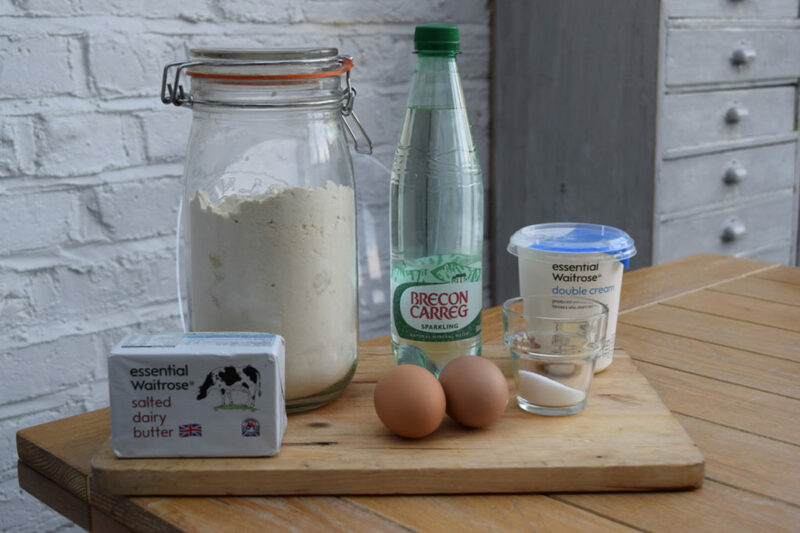 Spoon this into a piping bag using a 1cm plain nozzle, or when the bag’s full cut the end off to create a 2cm-ish opening. Or, if you don’t have a piping bag you can fill a food bag and cut the end of the corner and use instead. 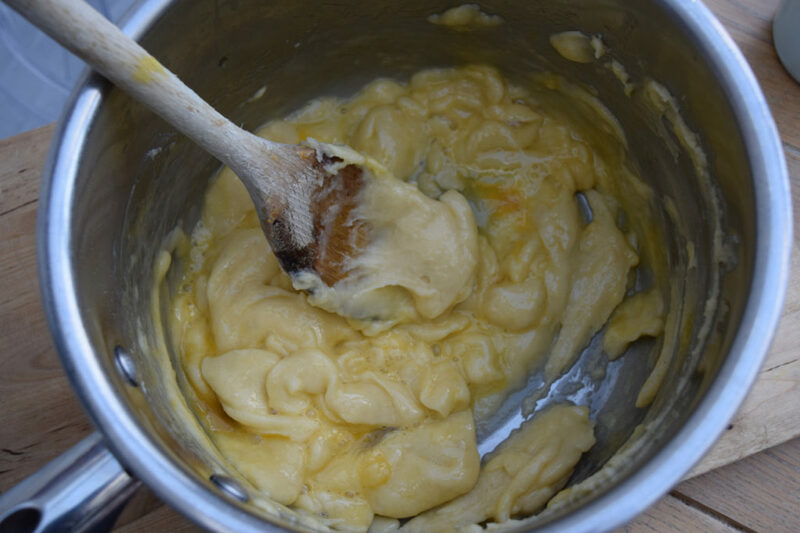 Or just add heaped spoonfuls of choux pastry on the paper for choux buns. 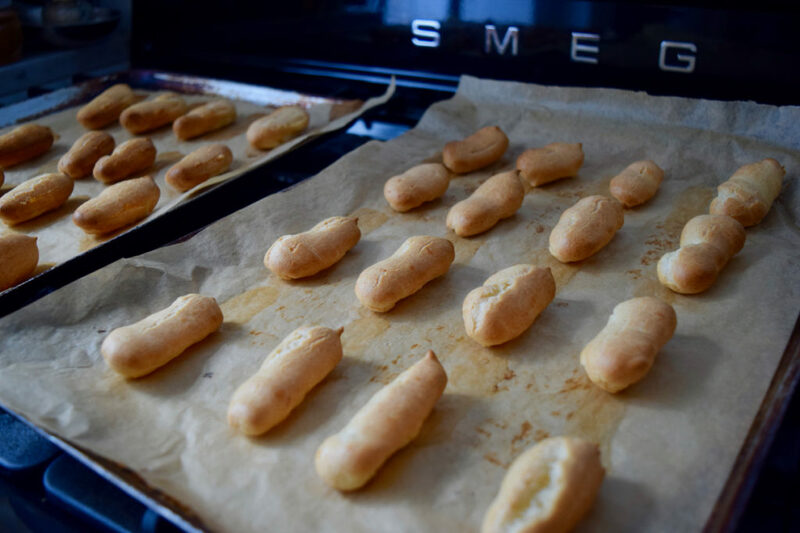 Drizzle a little water onto each lined baking sheet, then pipe 2 inch long lengths of choux pastry, leaving space to expand in between. Bake for around 15 to 20 minutes or until golden brown and crisp. Once they’re cooked, take them out of the oven and make a small slit in the side of each to release the steam. Leave to cool. 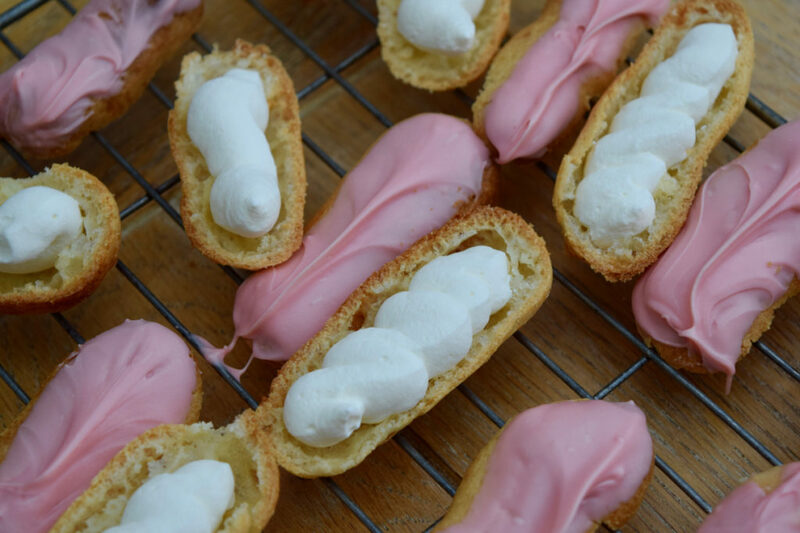 To fill and decorate these tiny eclairs, whip the double cream until you have soft peaks. Melt your chocolate until just starting a meld together. Or if using icing, mix the icing sugar with the water, using a couple of drops of food colouring if you like, until smooth. 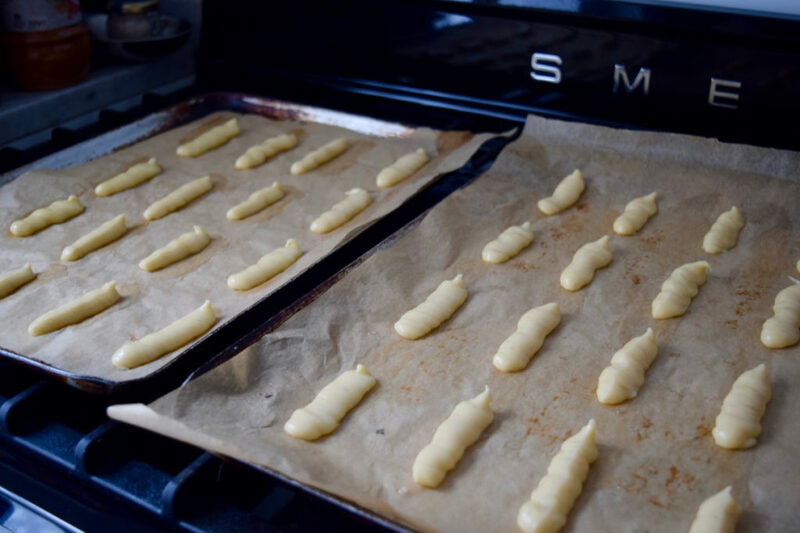 When you are ready to assemble your eclairs, split each one in half then either using a small piping bag with the end cut off or with a teaspoon, fill the bottom half of your eclair with cream. For the tops, dip each one in either your melted chocolate or icing and leave to cool on a rack. Sandwich the two halves back together, and pop onto a lovely serving plate and try not to eat all 30 at once. These will keep in the fridge for a day, but are best enjoyed straight away.